Listed below are the poker packages that we offer. 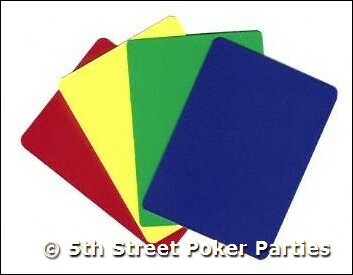 They come with everything you need to have a very fun and exciting poker themed event. The ring game format is a casual format in which guests have the opportunity to play when they want, if they want. It is similar to the type of game you would find played in a card club where players come and go as they please. Each guest is issued a chip voucher card for 2,000 in chips. This voucher can be presented to a dealer at any time. Guests can leave the table at any time by making a request to the dealer. The dealer will conduct a chip count and issue a new chip count on the voucher card and present the card back to the guest. Guests can return to any table at any time by presenting their updated chip voucher card to the dealer. Guests who are eliminated can be issued a "second chance" chip voucher for 1000 chips. At the end of the poker portion of the event, guests turn in their chip voucher cards with their final chip count. Trophy is awarded to the winner. Other prizes can be awarded to the top finishers. Table games can be a mix of No Limit Hold 'Em, Limit Hold 'Em, and Omaha. Blackjack tables can also be made available. The sit 'n go tournament format is a moderately structured format in which abbreviated mini tournaments will commence once enough players have been seated at a table. This format is modeled after the sit 'n go tournament format that has been made so popular by online poker rooms. Each table conducts its own single table tournament. Single table sit 'n go tournments are conducted continuously throughout the poker portion of the event. 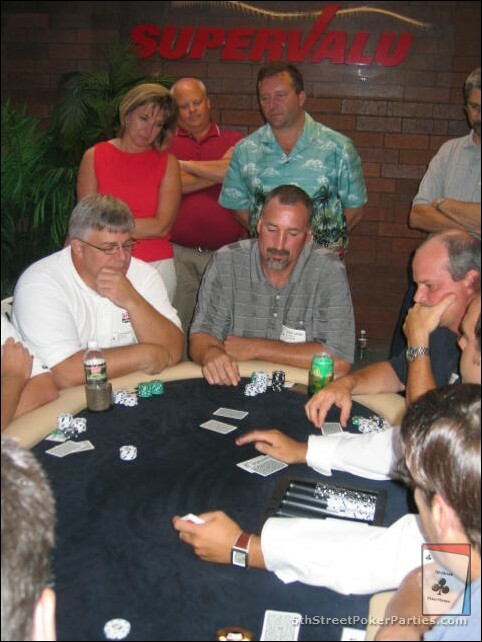 A new tournament begins when 5 or more people are seated at a table. Players are eliminated when they no longer have any chips. Tournaments are played until one person has all the chips on the table. 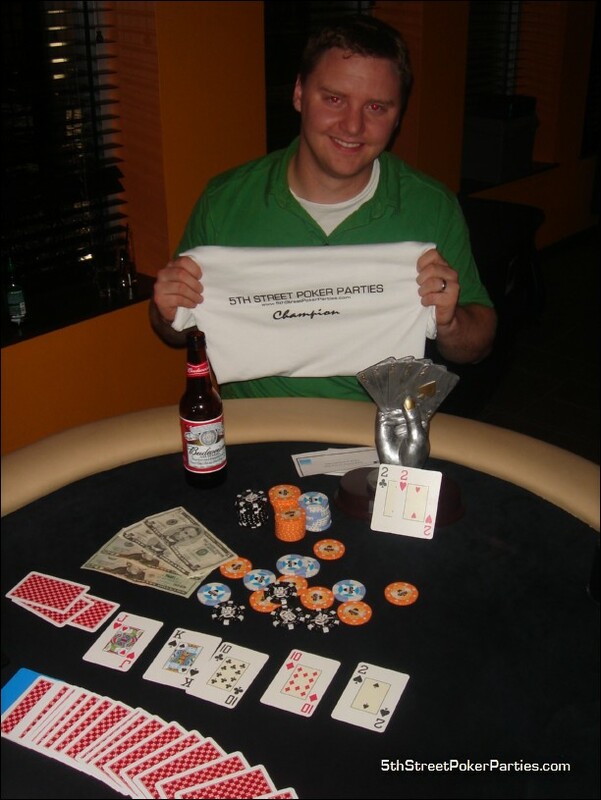 Prizes can be awarded to the winner of each single table sit 'n go tournament. Blind (betting) levels increase every 15 minutes. A typical single table tournament will take about 60-90 minutes. This full tournament format is a very structured format that is modeled after World Series of Poker or World Poker Tour tournaments that have been so popular on television. One main event tournament is conducted where players are eliminated when they no longer have any chips. 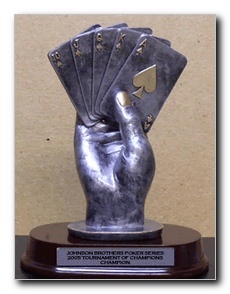 The main event tournament is played until one person has all the chips in the tournament. 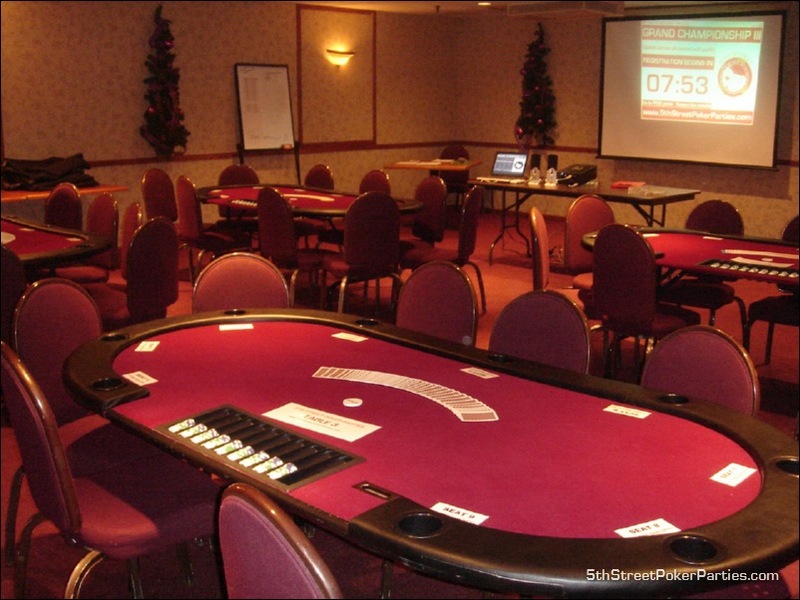 Event staff consists of a tournament director and professional dealers for every table. Blind (betting) levels increase every 20 or 25 minutes. A full tournament will take about 4 hours to complete. The tournament director utilizes the latest in computer technology to manage blind (betting) levels, eliminations, table balancing, and table consolidation. Eliminates players can join single table consolation tournaments that are run for a pre-determined period of time. 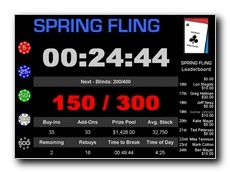 Winners of consolation tables can win a re-entry back into the main event. Same as the Royal Flush Full Tournament Package described above, but with an abbreviated event staff. Event staff consists of a tournament director and one professional dealer for the feature/final table. Outer tables deal for themselves. This format is the same format utilized by our bar & tavern poker leagues. Professional oval texas hold 'em poker tables up to10 players per table. 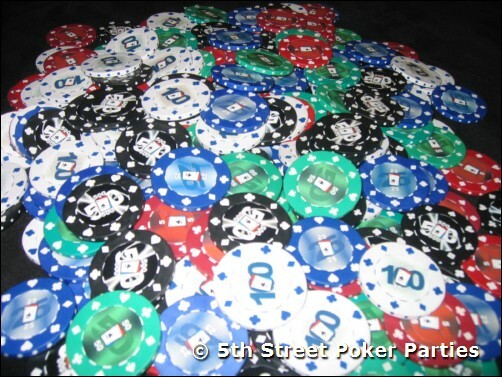 Actual casino quality clay poker chips with exclusive 5th Street Poker Parties design. Denominiations in 5, 25, 50, 100, 500, 1000, 5000 and 10000. Casino quality 100% plastic COPAG playing cards. Won't bend or crease. Poker tournament management computer software, just like the casinos use. (Click here to see details & screen shots). Tournament Director - The director will set up tables & chairs, distribute chips, resolve playing disputes, keep the play flowing and manage the clock (Full Tournaments Only). Professional dealers. 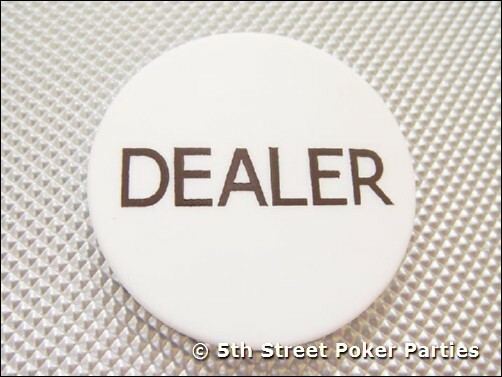 The dealers will arrive right before your event starts and will stay until the last hand is dealt. Tips are appreciated.